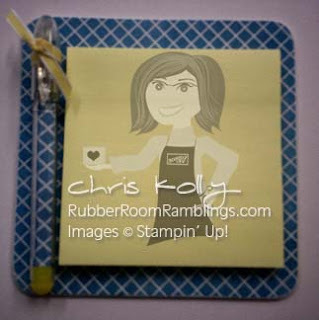 Rubber Room Ramblings: WATCH IT WEDNESDAY COASTER POST-IT-NOTE HOLDER! Welcome to Watch It Wednesday in the Rubber Room. 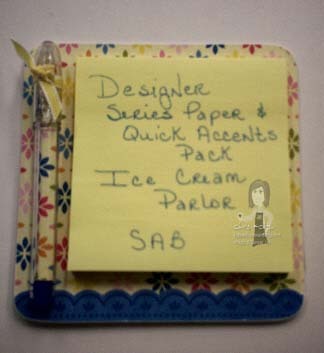 In today's video I will share you with a quick and easy idea for a little post-it-note holder. I am using a 4x4 beverage coaster for my base in this project and I will be giving you a couple of sneak peeks at some of the items that will be able for FREE during the Stampin' Up! upcoming Sale-A-Bration! I hate searching for a pen and paper all the time, but I find, as I am gracefully growing up, that more and more I need to write everything (and I do mean EVERYTHING) down. This is a perfect solution for me! I can have one on the fridge, one by each phone, one by the computer, one on my filing cabinet, one on my desk...... These are a great way to use up some of the scrap paper you are saving. They are so fun and easy to make, and I hope you will make one for yourself! Here is the one I show in the video with the Presto Patterns Designer Series Paper. I used Marina Mist Classic Ink to add the color to my Presto Patterns DSP. If you haven't used the Presto Patterns DSP, you really should try it! The possibilities for adding color to this DSP are endless, and it is so fun just watching the embossed images pop out of the color! This one is made with the Ice Cream Parlor Designer Series Paper and Quick Accents Pack from the Sale-a-Bration Catalog! I used a little blue ribbon "accent" on the bottom of this one. This one is made with the same Sale-a-Bration Paper and Quick Accents as the one above, only for this one I've added a little gree "accent" at the bottom. 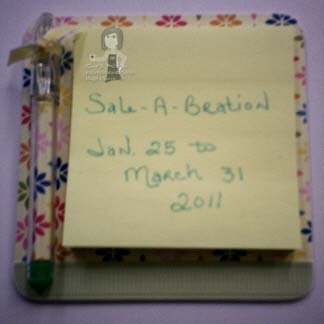 Sale-a-Bration begins on January 25th and it is a great opportunity to get FREE merchandise! Book your workshop with me today, so you won't miss out on all the FREE FUN! I hope you enjoyed the video today and are all inspired to make a few of these little Post-It-Note holders. Please join me in the Rubber Room again soon!